Ever since my husband and I moved from Madison, Wis., to Seattle, my parents have sent me a special care package in advance of my birthday. It usually includes a card, a few small presents--a book, a game--and a nice, big check. Well, said care package arrived yesterday--a week early. Being the impatient person that I am, I opened it right away. My favorite present? 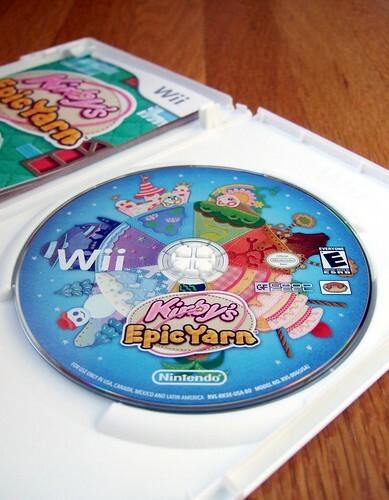 A copy of Kirby's Epic Yarn (below). I've only played the first few levels of the game so far, but already it has charmed the pants off of me. (Not literally.) I'm especially in awe (and in awwwww) of the yarn-based Kirby's cute transformations--which include a car, a parachute, a sub, a tank and more. heh, i'm so happy play'n Canvas Cource on DS, i wondor how u happy playing it. Happy (early) birthday, wish you many years happly living with your husband, and many graat games. :3 Sorz for mistakes. Man, I haven't played Canvas Curse in *ages*. I think I may have to pull it out again after I'm done with Epic Yarn. I'm looking forward to spending some more time with Epic Yarn today, BTW. I'll be sure to post lengthier impressions soon! Ha ha! Nice reaction, Justin :) Like I said above -- I'll let you know soon whether it's worth the price of admission or not. The game I look most forward to! Release in Europe isn't even this year.. Oh, envy thy name is Starfighter!